The 2017 Model ReModel project is officially underway in southern New England. This year's project, an old cabin that has been in the client's family for generations, is undergoing a serious makeover to become a retirement home for a brand new grandma. While she is active, agile, healthy, and still a few years shy of retirement, she wants a home that will not need to be renovated every decade to accommodate changing needs. So the renovation plan embraces Universal Design principles for kitchen, bath, and general living. He will replace the roof framing with raised heel trusses, which make more room for insulation in the attic. 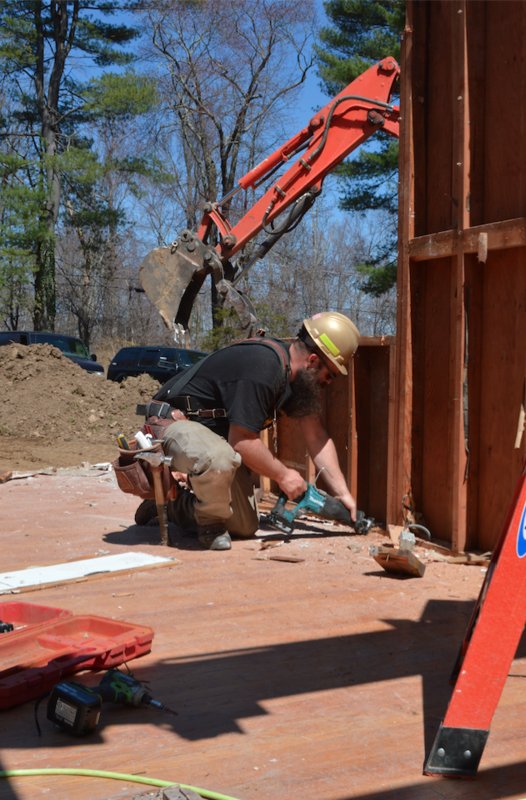 He will use ZIP R12 sheathing from Huber which features 2 inches of rigid insulation attached to the sheathing. Inside the walls will be Roxul mineral wool insulation, which will also be used for sound deadening in interior walls. The leakiest part of the house—the rim joist area—will be sealed at multiple stages of the process, because air sealing is THE most cost-effective step in energy savings. A standing seam metal roof from Valspar, new composite siding from Grayne, exterior trim from Kleer, and triple-glazed windows from MI Windows complete the outer shell. The tightened shell will have a balanced ventilation system that won’t bust the budget with an expensive HRV. Air King's powered and programmable supply fan is wired to the exhaust fans in the bathroom and kitchen to balance the outgoing air with incoming air whenever the exhaust fans come on. Air King’s kitchen range hood will be parked among high-end cabinets from Wellborn. The Shaker-style cabinets will bring out the simple, proportionally pleasing New England Greek Revival Farmhouse style of the home’s exterior, which we’ll talk about in a future post. Speaking of exhaust fans, steam in the house will come from water heated with a Noritz tankless water heater. It will (predictably) deliver water to the bathroom, where a five-piece Bestbath shower unit will be installed. The shower rolls many ‘Thriving in Place’ features into the mix – because it is constructed with solid, three-quarter-inch plywood under the resin coating, no blocking for future grab bars is required; the solid plywood is plenty strong for grab-bar installation anywhere in the shower, now or later. Also, the shower curb is removable for a barrier-free entry, if needed. Sinks and toilets are coming from American Standard, and will pretty much wrap up the live coverage before we polish the home up for the October and November issues of Professional Remodeler. Each week we will check in with a new episode of the Model ReModel Show as well as other quick updates from the jobsite or drawing board. We’d like to thank the sponsors for kicking in the products to make this Universal Design home for the future a thing.